Tourism Australia is encouraging the Australian tourism industry to positively embrace social media in promoting their business and is offering to help by giving operators access to its global network of three million Facebook fans. Australian operators are being offered the chance to promote their tourism business or region using Tourism Australia’s record breaking fan base by listing themselves in a ‘things to do’ section on its Facebook page. Tourism Australia Managing Director Andrew McEvoy said the tab is a powerful marketing tool, allowing the industry to showcase itself to more than three million fans and keen advocates of Australia. “Operators who haven’t already done so should really embrace digital and social media. People are passionate about travel and love to share their holiday experiences. There is a strong bragability factor about a holiday which plays out very strongly in social media and is a huge opportunity for operators to really tap into,” Mr McEvoy said. “There are lots of ways operators can now engage with Tourism Australia on social media - through YouTube, Twitter, Instagram, Pinterest and, of course, our Facebook page– where simply joining our ‘Things to do’ tab like over 600 Aussie operators already done - immediately gives three million people globally access to your tourism experience - that’s incredible free advertising,” he said. Mr McEvoy pointed to recent research by Teletext Holidays, revealing that over 25 per cent of Brits admit to booking a holiday after becoming jealous of their friends’ holiday pictures on Facebook – with Australia ranked as the number one enviable holiday destination. “We’ve had some great success stories from operators, like Pro Dive on the Great Barrier Reef who have started offering free wi-fi on their cruise vessels so holiday makers can share their amazing Reef experiences with their social media networks – what better way to promote their business, Cairns and the Reef,” he said. 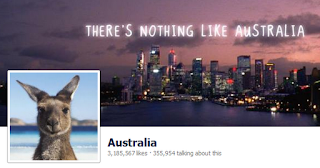 Social media has quickly become deeply integrated in Tourism Australia’s marketing activities, including the latest phase of its There’s nothing like Australia campaign, which has a strong digital focus and was even launched in Australia on the agency’s Facebook page. The new ad has already received more than eight million downloads, across digital and social media channels, including YouTube and, in China, Tudou, Youku, Banma and Baidu. “We’re constantly trying to demonstrate to our fans new reasons why there is nothing like Australia on our Facebook page and broader social media platforms, including internationally, like China’s Sina, Weibo and QQ, where every day we’re connecting with over nearly 400,000 consumers in our number one source market, China. “We’re harnessing the power of social media as we continue to enhance our presence in the digital space, and it’s paying off. We received a fantastic response bringing Asian super star Show Lo to Australia, with his online video series filmed around Australia in March being viewed by over 60 million people in Greater China to date,” Mr McEvoy said. How do you evaluate Australia’s social media strategy? Share with our readers your comments and thoughts.